Thankfully I'm almost back to normal. It's healing quicker than I thought, but it still feels like it takes forever! I don't mess with nerve stuff after my back/leg issues a couple years ago. I've been spring cleaning -- putting away chair covers, hanging stuff back up, sweeping the porches and cleaning the exterior lights. I also added flowers to our window boxes and the front planters. Our weather has been glorious so it's been so great to be outside! 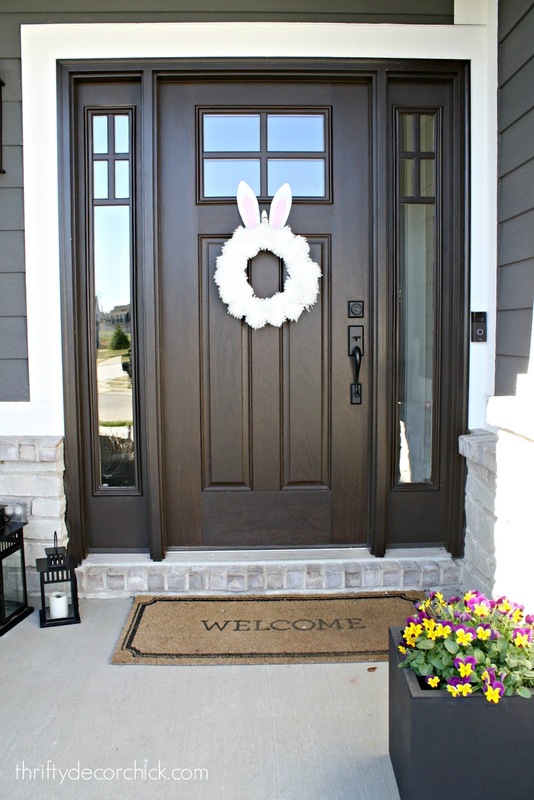 That fluffy bunny/Easter wreath is one of my favorites ever -- so dang cute!! It's held up well so far. I found it on clearance at Hobby Lobby last year and it didn't work anywhere inside -- so I hung it out here instead. It works with our house colors perfectly! 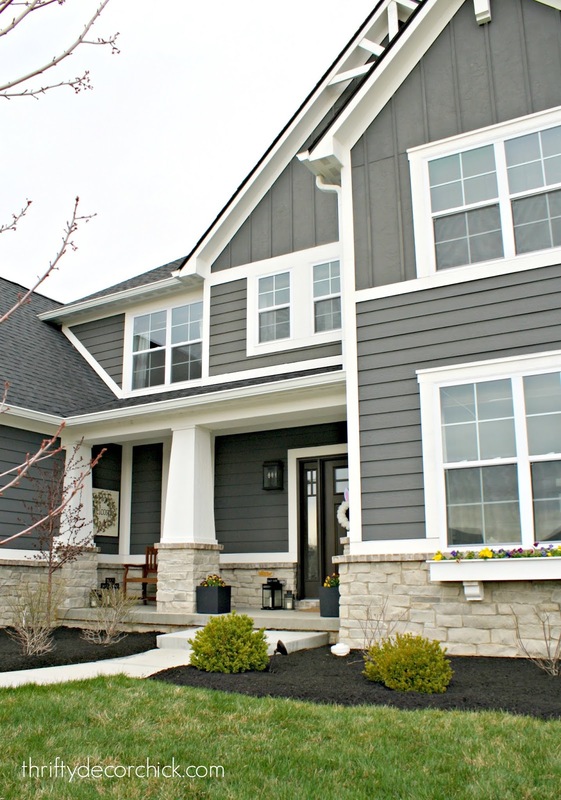 I love that combo with our dark siding color. The grass is greening up nicely! The lawn is my husband's baby and he's thrilled it's a little more established. It took forever to green up last spring because it was put down pretty late in the fall the year before. I planted some knock out roses and a few peonies last year -- the roses did GREAT. The peonies not so much. They can be finicky if not planted just right so I'm crossing my fingers for this year! 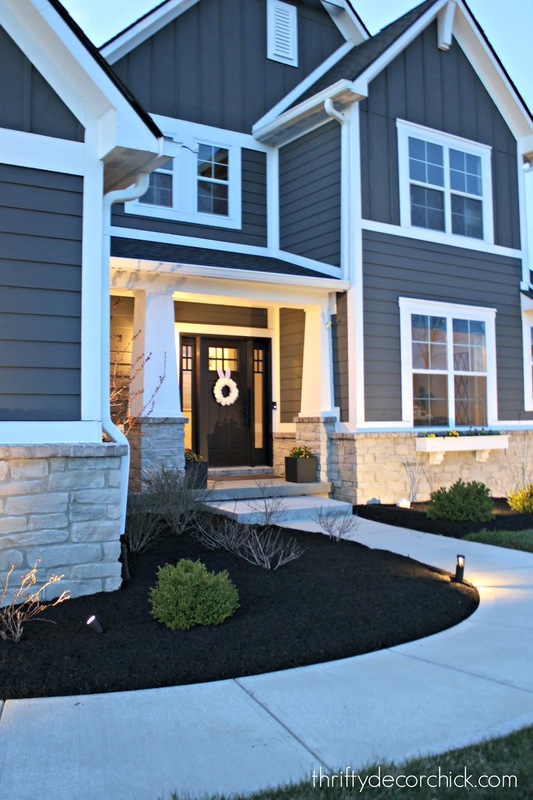 Landscape lighting is one of those things that really elevates a home -- I think it's one of the easiest and biggest changes you can make to your exterior! 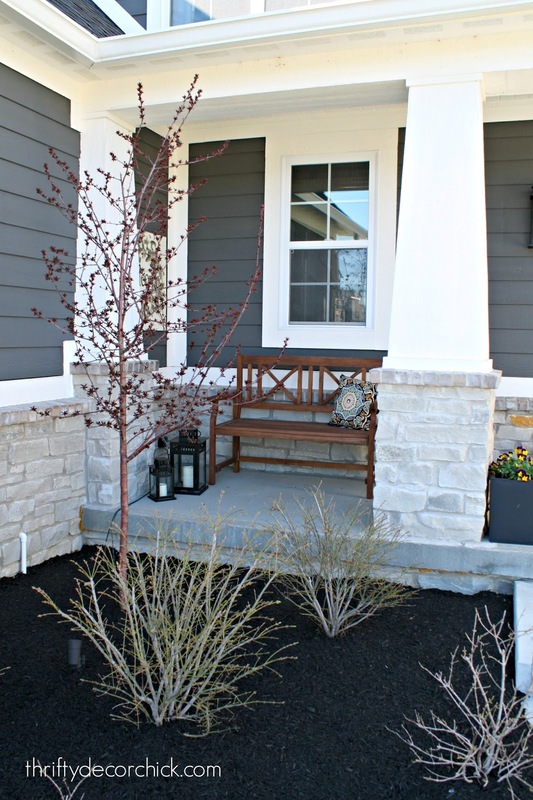 Obviously things aren't fully blooming just yet, but I'm so happy with the new mulch and flowers, I had to share a look at the house so far this year! 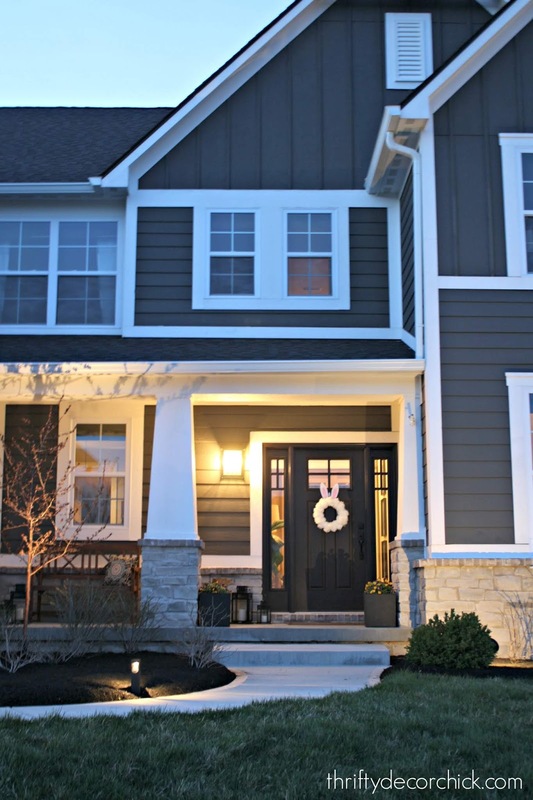 You can see our home in full bloom in this exterior home tour from last year. Have you started planting yet? 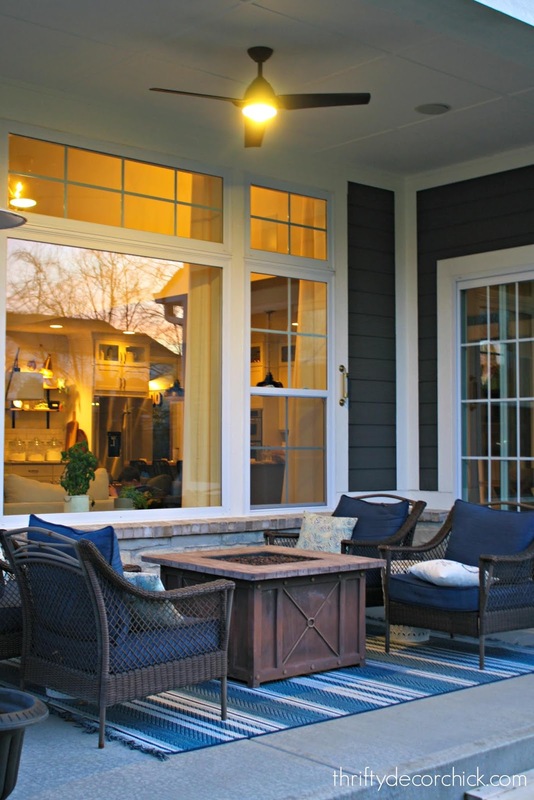 Any outdoor projects planned this year? I'm really hoping to get a garden started -- I'm SO excited to start growing food and herbs again! We'd also really like to get a patio started in the back yard, but we're not sure about pricing. If you know of any good concrete companies in Indy, please let me know! See more of our home here. 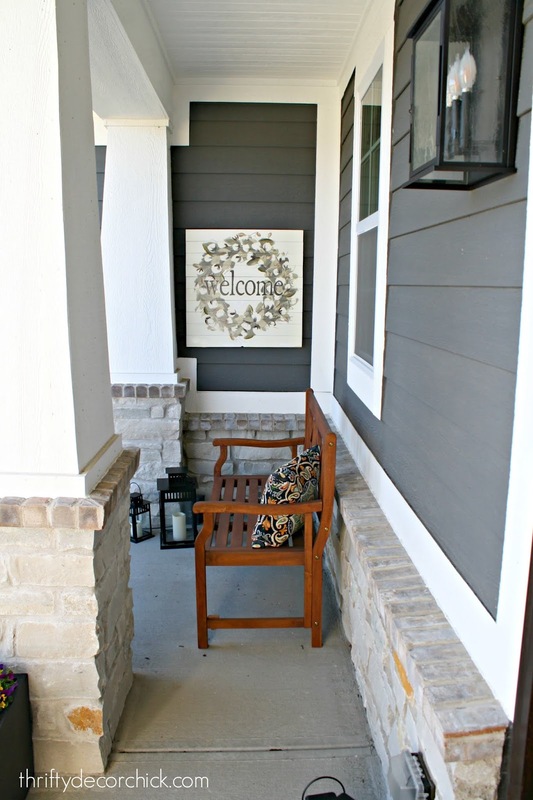 To shop items in our home, click here! Never miss a post by signing up to get posts via email. Love the lighting landscape so much. The house looks beautiful. That bunny wreath is SOOOOOO cute! I get the numb fingers whenever I do a lot of painting. I’ve found that just pulling my head down towards the opposite shoulder and holding it for 20 seconds fixes it! 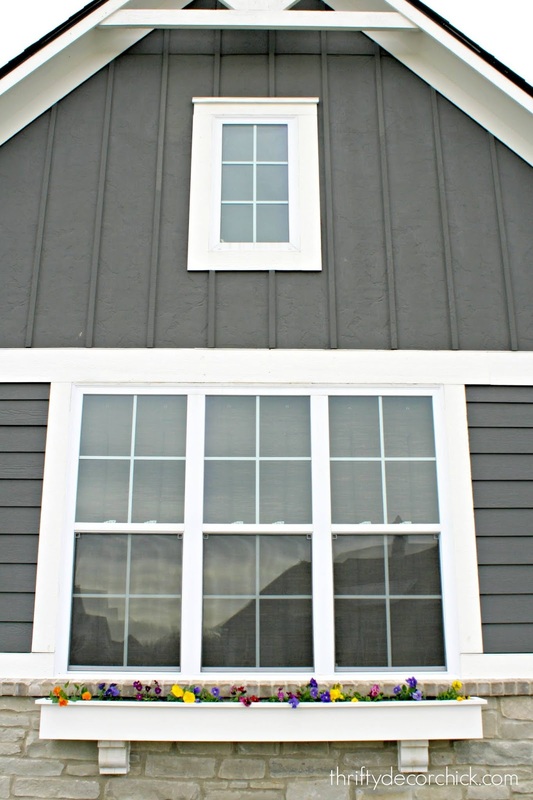 Can I ask what colors you used for the exterior paint? 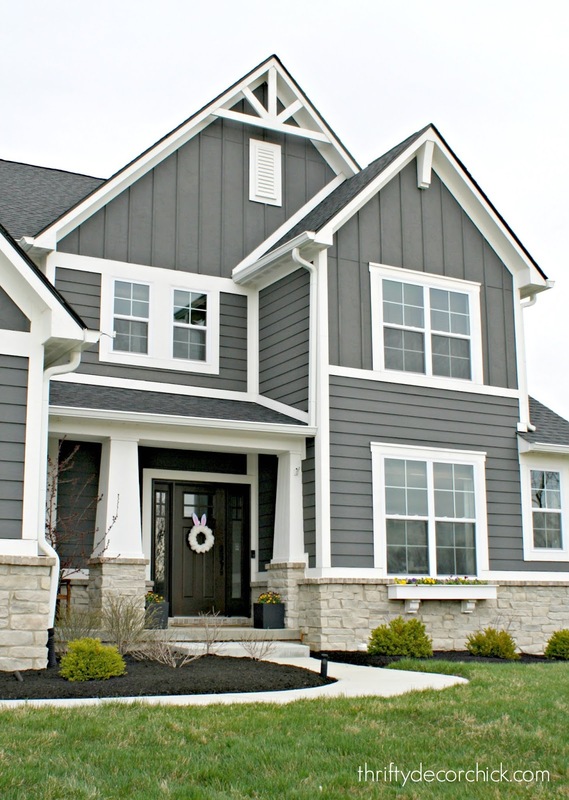 Getting ready to paint our home and just love your color! Seriously you can do no wrong! Love it all. 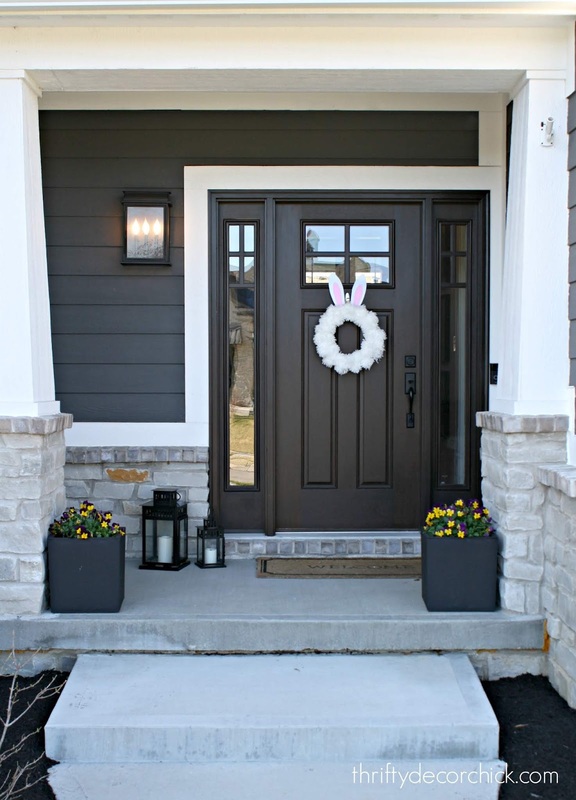 The bunny wreath is adorable and that Welcome sign is a home run! So encouraging to see green grass and flowers after the winter we’ve had in Wisconsin! You are inspiring me to install outside lightening! I especially love your back patio - looks so inviting! Everything I've seen you do is top notch and these photos are no exception! One thought though - do you think that ornamental tree is planted in an awkward position, eg too close to the house?? I would love to start planting and doing outdoor work but we got a foot of snow yesterday (southern MN). Until it melts, I'm focused on indoor projects. I'm currently renovating my master bedroom - replacing the carpet with Pergo XP, replacing the 3 rotten windows, removing the popcorn ceiling, painting the walls and ceiling, replacing the 2-prong outlets with 3-prong, installing new trim and replacing the ugly light fixture with a ceiling fan. I would also like to install a new closet organizer. Next fall I'm planning on tackling the master bath (it's nasty). We (my parents and I) moved into our house last April and it's a fixer upper. We are focusing on one room at a time. Spent all of last year focusing on making the unfinished basement into a walk-out in-law suite (2 bedrooms, bathroom, kitchen and living room) so my parents can live down there. Now that my parents are comfortable living downstairs, it's time to focus on my area of the house starting with the master bedroom. SO beautiful!!! I started pansies and snapdragons from seed and I think they are ready to be planted out now...I just wish I knew what color they were so I could 'plan' my planters - oh well! More garden cleanup will happen tomorrow, I'll be wicked sore tomorrow night no doubt, sigh this getting old thing is tough.